Gumby and Pokey are touring the U.S. Our dynamic duo (6” bendable toys from the ‘60s) are on display in the new exhibit: Toys of the ‘50s, 60s and 70s. Now appearing in its fifth U.S. city, the exhibit is drawing large crowds. This fun exhibit chronicles toys through three decades. And you guessed it… Gumby made the cut. Gumby. Barbie. Slinky. Mr. Potato Head. Wham-O. Spirograph. Hot Wheels. The names of popular toys from the 1950s, 1960s, and 1970s capture the craziness, the joy, and the sheer fun of being a kid. But beneath those nutty names are rich veins of nostalgia, memory, and history. The stories of the kids who played with these toys, the adults who bought them, the child-rearing experts who judged them, and the people who invented them reflect the rhythms of American life. Experience the toys and their stories through three imagined living rooms that bring the decades back to life. The exhibit opened at the Missouri History Museum on October 29, 2016, and runs through January 22, 2017. Learn more here. 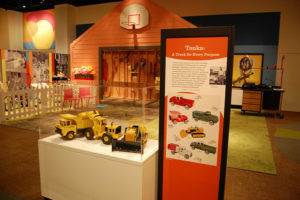 The exhibit, organized by the Minnesota History Center, has shown at the Colorado History Center and the Heinz History Center in Pittsburg, PA in association with the Smithsonian, and Museum of History and Science in Seattle. 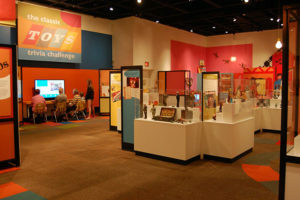 Get a sneak peek of the exhibit in this video produced by the Heinz History Center: >>Watch now. It’s fun for the entire family! Be sure to check it out if it appears in a city near you. 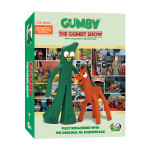 Here come Gumby and Pokey in a new DVD gift set of wild and inventive late 60’s episodes! The Adventures of Gumby, 1960s, Volume 2 was just released on September 13, 2016. It contains over 40 clay-animated episodes, fully re-mastered from their original camera rolls and soundtracks. A great bonus—two Blockheads bendab le toys are included. Get yours here. All of the episodes featuring Nopey, the dog who only says “no,” can be found this set. 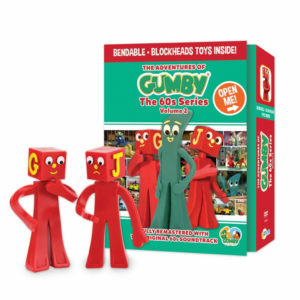 Also appearing are Prickle, Goo, the Blockheads, Professor Kapp, Dr. Zveegee, the Moon Boggles, and other characters with whom Gumby and Pokey have creative, fun adventures. These cleverly written stories engage both children and adults with enduring themes that captivate today’s audiences as they did when first released. Some great special features are included: the art film “The Clay Peacock;” a behind the scenes photo gallery; the re-mastered “Have a Heart” animated theme song; and super fun clay animated bumpers. You’ll also get to see some of the animators who worked on these episodes talk about their experiences at Clokey Productions. These same animators went on to animate hundreds of iconic films from Star Wars and beyond. 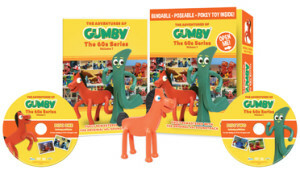 The set is now available at Gumby.com, and will be on shelves at major retailers such as Target, WalMart, Best Buy, Sam’s Club, Barnes and Noble, groceries and other stores in October-December, just in time for the holiday season. Don ’t forget Vol. 1 of the 1960s and the ‘50’s collection DVD sets. Each set is a great value with over 200 minutes of programming and unique bendable toys. Collect them all!